Has anyone tested if PEI sheet works on top of regular glass without using paint on the back of it? I tested with some heat paint I had lying around now but the PEI sheet deformed bad when heated to 150 degrees. I guess having it uneven would be a lot worse than detecting the glass behind the PEI sheet? I once used PrintBite (similar to PEI - might even be PEI) on 6mm glass on 10mm Aluminium with the Aluminium painted with matt black stove paint. The IR probe worked fine. 150 degree bed temperature? 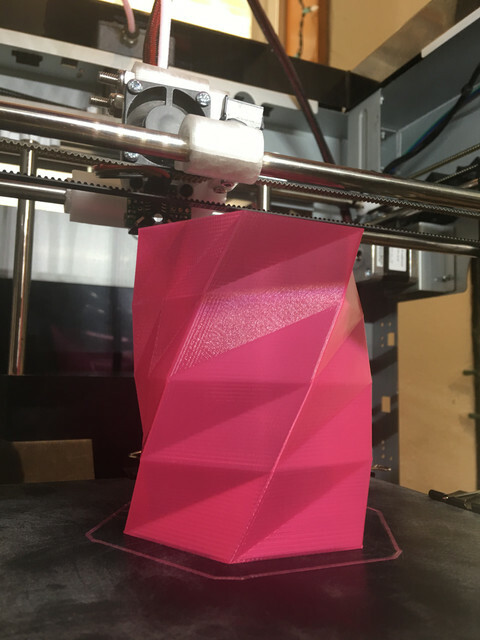 What are you printing that needs that? The barbecue/stove paint I used didn't have a spec sheet. I heated the painted PEI sheet to 180C in a fan oven for 2 hours, and that worked. Then this pei is of another quality since it warped and got ruined at 150degrees. So its not possible to use it without? Can you not paint the aluminium (or whatever is under the glass). I worked for me even with "PrintBite" on top of the glass. Or maybe paint the underside of the glass or use black paper?. I am sorry to hear that. Perhaps your oven was hotter than the temperature you set. Domestic ovens without fans in particular can be wildly inaccurate, and they have a large temperature variation between top and bottom. If using PEI that is thick enough to not need to be glued down, then painting whatever is under the PEI or using a sheet of black paper under the PEU may work. This won't work if you need to glue the PEI down because the adhesive layer will reflect IR in variable proportions depending on bubbles etc. Another way you can get PEI is as a very thin layer deposited on top of an aluminum plate. I painted the Glass on my Max V2, then stuck the PEI on top. So far so good using an IR probe. I bought PEI that has the adhesive on it, so that I could use a wet install and get all the bubbles out. So far the Black polycarbonate sheet is working out well. I used a vibrating sander keeping the PC wet with 60 grit then 120 grit. It sticks perfectly with PLA, have not tried others yet by I am sure it wont be a problem. Oh and it sticks so well that I am not using the bed heater at all. So I just bought a large 3mm thick sheet from amazon in black and cut it into 4 build plates because the IR probe does not take kindly to the white Fleks3d plates. If shorting the sensor on the heater block caused a permanent fault, that suggests that the heater block is live i.e. shorted to +12 or +24V. One possible cause issues faulty heater cartridge. I suggest you check this with a multimeter before it causes any more damage. The short may only occur when the cartridge is hot. The assembly instructions advise putting Kapton tape over the back of the IR sensor if it is close to the heater block. 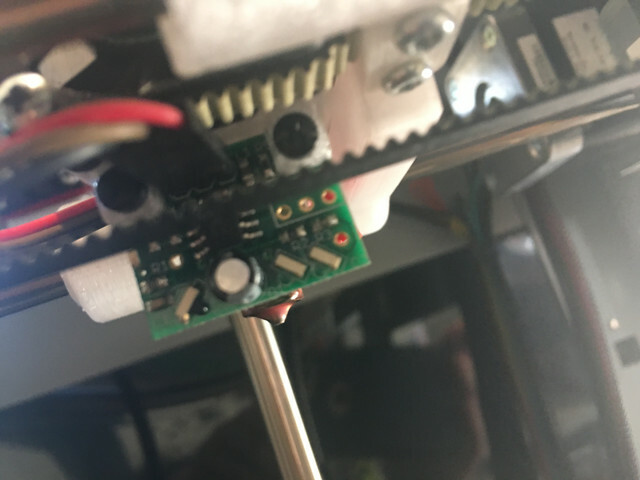 Thanks DC, ill check it out… yeah its really wierd, it seems to handle the homing probe just fine but mesh bed is all over the place now where before i was all green. Ill have to order some kapton tape. Is it the original IR probe with the wire-ended optical components, or the newer one with SMD optical components? Of it's the older sort, the problem may be that the optical components have been bent out of alignment after a head crash. Here is for anyone that wants to see the beauty of using black polycarbonate sheet… this is a single wall vase mode. It popped right off after just by flexing the plate in a few directions and there were no issues sticking to the plate without glue or anything, stuff sticks too well sometimes and needs help of a scraper after flexing. Today I tested PEI Sheet rubbed with 1200grit sandpaper to get a rougher surface. The measurement were all over the place and useless. Here is some output from the probing. When probing the glass sheet it's ok-ish flat with two exceptions that I got no idea where they are comming from. It's only -0.03mm so no biggie but when increasing the probe points it's +0.03mm so it chages direction and it's on the same spots on the bed. Looks more like a bug. Anyways these are just for a reference to show that it works fine on glass. And finally 77 points on PEI sheet glued on top of glass. I've done multiple probings of the PEI and glass probing before/atfter pei just to confirm that the sensor is doing it's job. My conclusion is that PEI, even scruffed down with 1200grit, doesn't work with the IR sensor. Going to try a FSR sensor next time for PEI.